Byblos is the Greek name of the ancient Phoenician city Gebal in what is now Lebanon. It is believed by many to be the oldest continuously inhabited city in the world. My father is from Beirut and my mother is from Zahle. They moved from Lebanon to Australia, where I was born, before moving to Syracuse. My parents are the chefs at Byblos. My background is in marketing and research, so I spent a year researching before we opened. We looked at the Syracuse area and found that there wasn’t a restaurant in the area serving authentic Lebanese food. We wanted to appeal to a diverse group in Syracuse. We find a large part of our customer base is people who are seeking healthy, fresh food, as well as authentic food. Falafel served at Byblos Mediterranean Cafe in Syracuse can be an appetizer (foreground) or eaten in a pita wrap (background). Before he left his home in Beirut, Lebanon for the last time, in the early 1980s, Philip Khabbaz went to see a man named Jean who owned a shop that sold nothing but falafel, the famous fried vegetable patties of the Middle East. 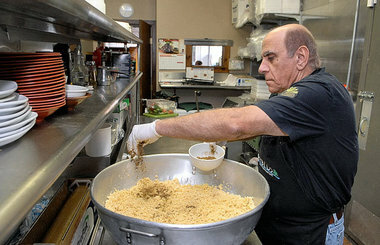 "There were lots of falafel shops -- specialty falafel shops, but his always had a line," said Khabbaz, part of the family that now owns Byblos Mediterranean Cafe in Syracuse. "His falafel was the best." Khabbaz had to prove to Jean that he had no plans to return to Beirut -- and become a competitor -- before he received what he wanted: the recipe. "My flight was Saturday," Khabbaz said. "I got the envelope on Friday." Such is the allure of falafel. It's eaten almost everywhere in the Middle East and in parts of the Mediterranean region -- and it's a low-cost item on just about every American restaurant menu serving Middle Eastern fare. It's hard to imagine Syracuse restaurant stalwarts like Munjed's or King David's without falafel. Like many traditional foods, its origins are murky -- probably in ancient Egypt -- and the ingredients can be as varied as the landscape of the region. "There's a kind of mystique with falafel," said Julie Ann Sageer, a local chef and cooking instructor who comes from a Lebanese family and now lives in Marcellus. "Maybe it's the distinctive shape, the beautiful golden earth color -- representative of the earth colors you see in the Middle East." Who serves the best falafel in the Syracuse area? Send your nominations to food@syracuse.com by Monday. We'll pick those with the most nominations and conduct an online poll at www.syracuse.com during that week. Meanwhile, those who send in a nomination will be entered in a random drawing for the book "Classic Lebanese Cuisine" by Chef Kamal Al-Faqih, (ThreeForks; $24.95). Be sure to include your name and mailing address. One entry per person, please. 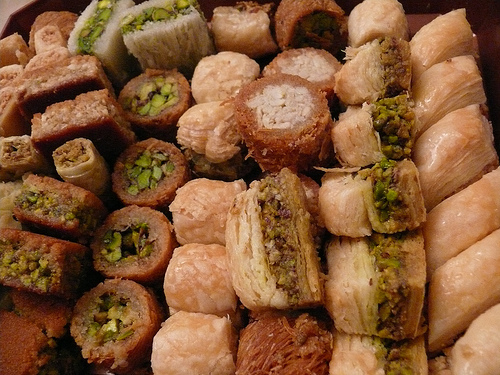 Local Lebanese chef/instructor Julie Sageer -- aka Julie Taboulie -- conducts a demonstration on Middle Eastern comfort foods, such as "Kafta bil Sanieh" 7 to 9:30 p.m. Thursday at the Marcellus Free Library, 32 Maple St., Marcellus. The fee is $15. To register, call 673-3221 or go to www.library.marcellusny.com. For more on Sageer's events, go to www.JulieTaboulie.com. And, of course, the taste. "It's honestly one of the tastiest things you can eat," said Sageer, who goes by the name "Julie Taboulie" in her professional life. "Crispy-crunchy on the outside, spicy on the inside. They're so addictive. They invite you to eat more." Yet falafel starts with a humble main ingredient -- garbanzo beans, also known as chickpeas, and sometimes fava beans. The beans are soaked overnight or longer, then ground up, but not too finely. To that base are added garlic and onions, spices and sometimes herbs. This mix is formed into patties, then fried. That sounds simple enough. Then the variations begin.